If you’re looking to spruce up your entryway and create a classy, yet noteworthy exterior then it’s time to brighten up your home’s exterior by choosing a front door color. We all know those homes you drive past on your way home from work or that perfect house you saw while vacationing somewhere tropical. Everyone can pull off a colorful front door, it’s simply a matter of knowing what hue is right for you. 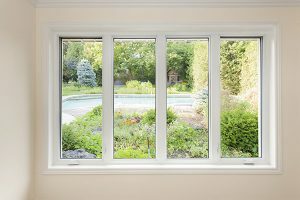 While your house may not end up in a magazine for its elegant exterior, it will certainly be admired by your neighbors, family and friends. While no color is off limits, it’s crucial to consider a few aspects when choosing a front door color. After deciding you’re ready to replace your entry door, begin looking at many different paint samples. To avoid being stuck with a color you don’t like, it’s important to look at multiple shades and consider the climate you live in. If you pick a color based on its appearance in the store, it could look completely different once it’s on your door. Paint samples will appear different depending on the lighting they’re in. Take paint samples home and view them outdoors, both in the sun as well as in the shade. Once you choose a front door color, test the paint on your home. This allows you to see the paint at different times of day and in different weather conditions. It’s crucial to test different hues of the same color on your entry door. While a darker shade may look lovely in the sun, it could appear gloomy on an overcast day. Although going through many different paint chips is helpful when deciding on a color, testing the paint is even more important. With paint samples you’re only able to go so far in determining the final look that you will be able to achieve. 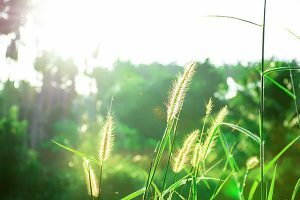 The climate of the area you live in can also affect the appearance of your home’s exterior. 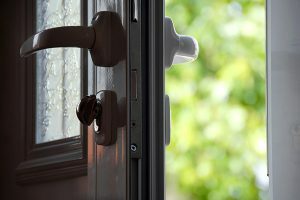 It’s important to consider this when choosing a front door color because certain colors work better with temperatures that are cooler year round. Doors that are constantly in a warm, sunny climate or those that are hit with afternoon sun can create challenges for darker hues. Darker colors will fade more quickly in this environment and need to be repainted more often. 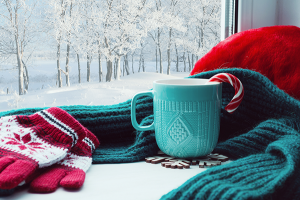 Brighter colors will also help to cheer up a cooler climate during the winter and provide some sunshine even on a cloudy day. Some colors can look tacky on a home’s exterior but it comes down to understanding which colors complement each other and which don’t. Yellow is associated with cheeriness and sunshine, shining bright even on those overcast days. Those who are looking to bring warmth to the exterior of their home and want their guests to smile before entering their home should consider yellow. A true yellow pairs well with neutral shades, including a crisp white, shades of gray, tans and sometimes subtle shades of blue. Homes with medium toned wood siding pair nicely with a yellow front door as well. If your home is already a bright white, a yellow door can create an even brighter exterior. This look can be complemented with charcoal gray siding as well. If you’re looking to make a statement or invoke emotion, red is the color for you. It conveys power and strength while creating a vibrant entryway to your home. Bright red front doors look great with brown, tan and taupe exteriors. They can also be paired very beautifully with blue gray colors or medium wood finishes. Natural wood siding and light gray siding complement vibrant red shades as well. If you are looking to make the exterior of your home more colorful and sophisticated, deeper red shades such as burgundy will do the job. Deeper reds look good with lighter greens or on homes with brick accents. Another way to keep a deep red front door appealing is by pairing it with black and white for a more modern look. If you live in cooler temperatures for majority of the year, a deep red front door with a black exterior creates a very bold statement. Neutral exteriors also pair nicely with deep red in climates that are usually cooler. While many tend to shy away from orange, it can create a very welcoming look. Similar to red is it unexpected when homeowners are choosing a front door color but it is very modern. Orange pairs nicely with a variety of home exteriors including those which are minimalistic with hues of gray. Taupe exteriors also look very nice with orange because they’re warmer and more subdued, which softens vibrant shades of orange. If you’re looking to revamp your exterior, green is a great option to liven your entryway. Green will complement many different colored exteriors and can make your landscaping stand out. Green pairs very nicely with blue gray exteriors for a more modern look. Install a green door against a red brick background and it will create a stark contrast due to their positions on the color wheel. Emerald green is also a lovely choice because it’s a great way to keep the entryway interesting yet simple. For those seeking an adventurous option, bright green and mint green pair well with a bright white exterior. 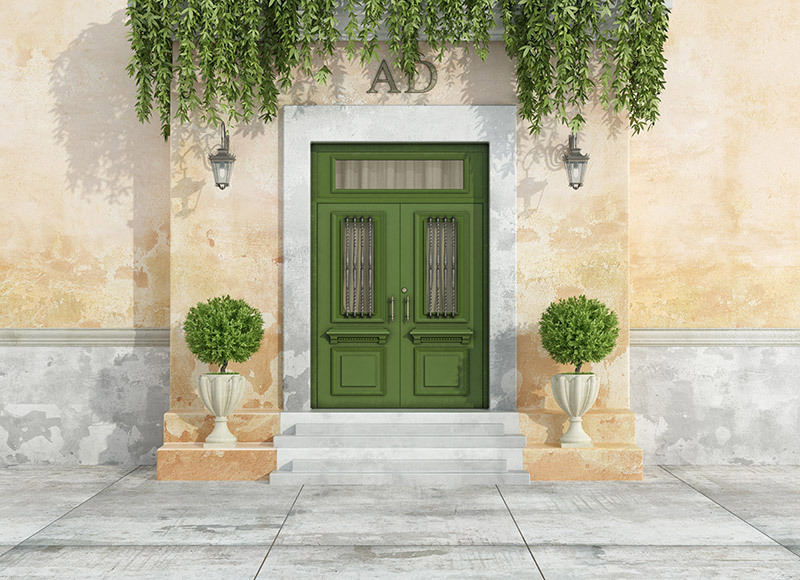 Another option for a front door is using a jade green against terracotta which works great in warm climates. Although blue is many peoples’ favorite color using it for your front door can be original depending on the shade chosen. 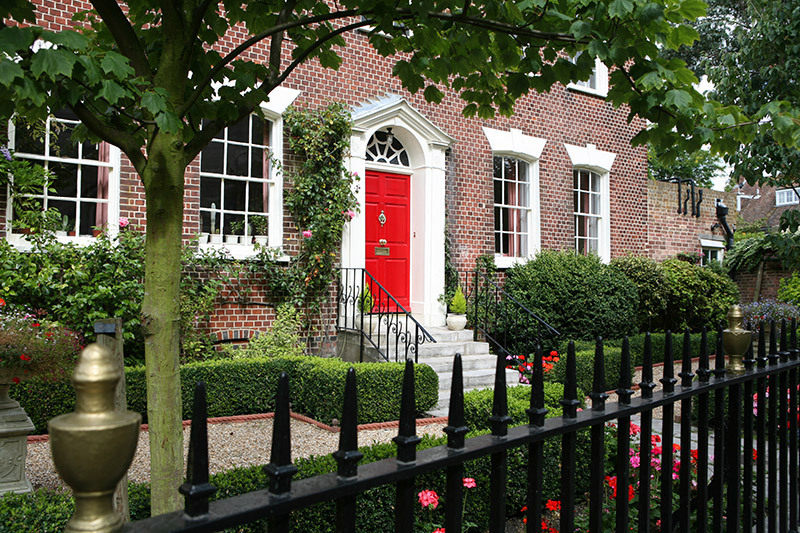 Blue pairs very nicely with a red brick exterior for a subtle look. In order to create a rustic appearance, light wood, complements a light sky blue front door. Lighter shades of blue also pair nicely with neutral siding or stone exteriors. 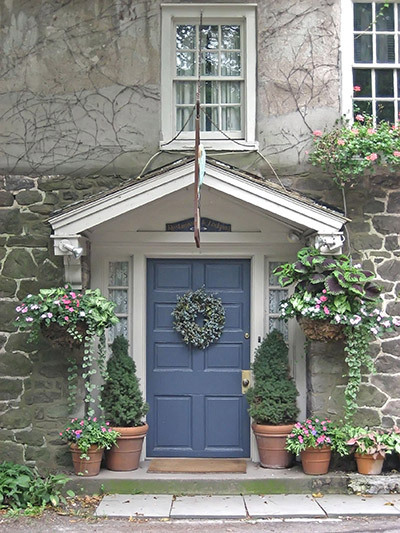 Homes with a wide range of colors pair excellently with a navy blue front door and blue gray doors enhance stone architecture. The blue gray tones of the stone are emphasized through the color of the front door. Seeking a dramatic, elegant entryway to greet your guests? Black is the perfect solution when choosing a front door color. Black front doors work with many exteriors. A lovely pairing is a black front door with a light, classic shade of yellow for the exterior. Another option to incorporate black is to couple it with a dark gray exterior and create a contrast with white or neutral accents. Ombré effects can be created through the use of the same color as dark accents and lighter siding while incorporating a black entryway. Red brick is another great option since the spots of black within the brick will accent the front door. Many of us admire homes with stunning entryways and, with the right color pairing, your home will be appreciated from afar. Remember it’s important to consider the lighting and climate when choosing a front door color. Once evaluating which colors pair well with your exterior test multiple hues on your home before making a final decision.